• Ranges Available: - 0 - 10%, 0 - 18%, (A) 0 - 32%, (B) 28 - 62%, (C) 58 - 92%, 0 - 55%, 45 - 82%, 0 - 80%, 0 - 90%. • Hand Salinity Refractometer ERMA makes 0 - 28% AND 0 - 100%. We are engaged in offering Hand Refractrometer ERMA Range. Ranges Available:- 0 - 10% , 0 - 18% , (A) 0 - 32%, ).Hand Salinity Refractometer ERMA make0 - 28% AND 0 - 100%. Hand refractometer model D, for urine, serum / protein, erma japan make model : D , Refractometer for battery / coolants, ERMA japan. Erma Make Hand Refractometer provide with a direct reading of the scales we can easily know the concentration or refractive index of liquids. - Easy and very convenient to use. 28 - 62%58 - 92%. 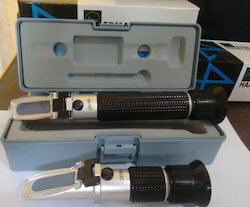 We are engaged in offering Erma Japan Refractometer.